All our rooms are fully furnished and equipped with either double, single, twin, triple beds or dorm bunks, writing desk, shelf, armchairs, wardrobe and table/wall lamp. Most rooms have en-suite shower room and toilet and we have hot and cold water 24 hours a day. All our rooms also have a color television, fridge, private telephone with your own direct phone number for voice & internet access and air-conditioning (essential in Hong Kong's humid climate). 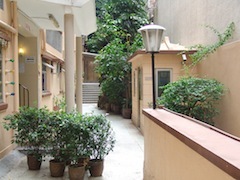 Self-serviced laundry and dryer facilities are provided in the building. 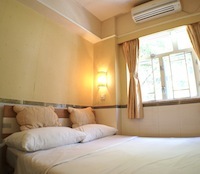 Cooking facility is available in some rooms with fully equipped kitchenette/pantry. If required, we can provide maid services, ironing, faxing, photocopying and personal computer facilities at minimal charges. All residents can use our computer facilities to check and send email - now the most important facility without losing contact with your family and friends all over the world.